Here is the graph from our sitemeter traffic counter. 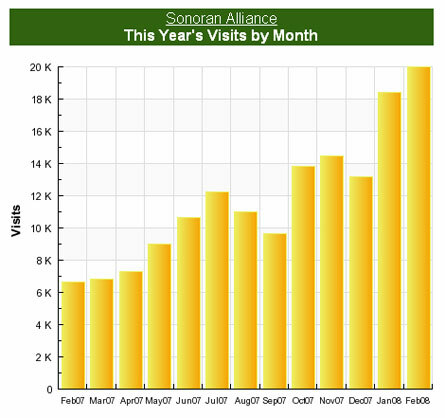 We are not claiming that these are unique visits, only that the trend is excellent. Compare this with Espresso Pundit’s graph on how the newspapers are doing. A big thank you to our readers and contributors! When we had our first child 2 years ago, we received a letter in the mail from Governor Napolitano congratulating us on our new baby. What does the governor have to do with us having a baby? 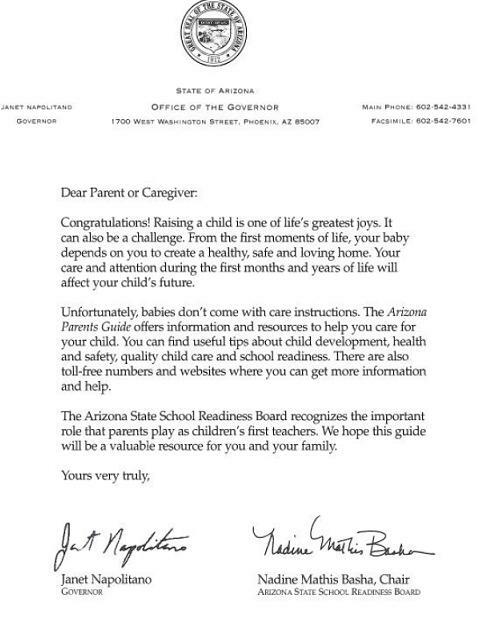 I wonder how much it cost to send those letters out to every parent in the state who has a baby. We were disgusted with the obvious self-promotional purpose of the letter. There was no need to send it, we didn’t get anything out of it. When we had our second child a year later, we received another letter from Napolitano, this time inserted into a packet from the Virginia G. Piper Charitable Trust about how to raise children. The letter is below, and it’s on the governor’s official state stationery. I would hope that Piper Trust paid for the mailing and copies of the official letterhead, not us state taxpayers. Regardless, it’s still inappropriate for the governor to be using her stationery to send out frivolous letters to new parents. And it’s insulting. Napolitano doesn’t know more about raising children than we do, especially since she doesn’t have children. This is more free campaign advertising for Napolitano skirting the law in preparation for her future Senate run, more of the wasteful self-promotion that our friends at Red State Arizona pointed out yesterday. Unfortunately, as Red State points out, the mainstream media won’t cover this, they’re so blinded by their love for Democrats they will only write fawning articles about Napolitano. Meanwhile, our tax dollars continue paying for her to skirt campaign laws and promote herself. I’m getting sick of reading blog post after blog post about this puffery on the public dole continuing to occur, is there anybody home at the Arizona Republic or are they too busy packing up to go out of business? The legislature is moving toward passage of a ban on late term abortions. Representative Kyrsten Sinema is preparing to oppose the law. The procedure, which Sinema wants to keep legal, involves delivering a baby feet first (breach) and then dispatching the child while it’s skull is still in the birth canal. Sinema defends her action by saying the law impinges on a “woman’s rights.” What about the pre-born females who don’t survive the event? So much for feminism extending to the whole sisterhood. Humphries picking up the pace. After much thought, and encouragement from fellow residents and community leaders I am excited to announce the formation of an official exploratory committee for my potential candidacy for Arizona’s Fifth Congressional District. It has become increasingly clear that the “change” of 2006 quickly became “business as usual” in 2007. And 2008? Well, it’s an election year – nothing will get done. What will the Washington DC talking points be this year? We were told last year and will be told again, that immigration reform, balancing the budget and ending our dependence on foreign oil were and are the top priorities of our current Congressman. Predictably, nothing has happened on those fronts, except an increase in deficit spending. We don’t need any more rehashed talking points from Washington DC – we need action points. The challenges facing the Fifth District require action, and leadership. As a second-generation Arizonan, I can remember when we were a “small” state. It took great leaders to fight for Arizona’s interests on the national stage. We are fortunate that our small state was blessed with true, larger-than-life leaders like Barry Goldwater, Carl Hayden and John J. Rhodes. 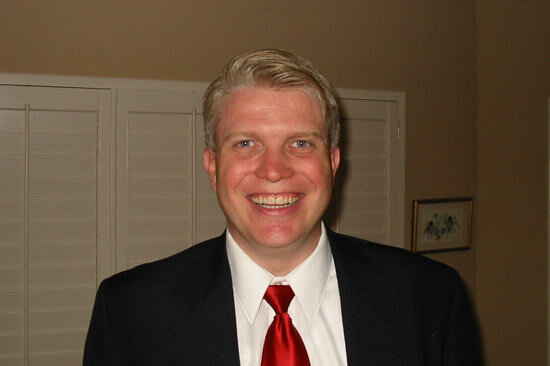 My introduction to Washington politics came as an intern for Republican Minority Leader Rhodes. It was a different time in Washington and in our country, but leadership is timeless. As a tax-cutting member of the Scottsdale City Council; a consolidation advocate on a local school board; and a steward of our most precious Arizona resource as the President of the Central Arizona Water Conservation District Board, my record of leadership on vital Arizona issues is clear. Over the next month I will explore within the framework allowed to determine if my brand of leadership and action are right for the Fifth District. I invite voters to share with me their ideas about how to make sure our interests are best represented in Washington DC. 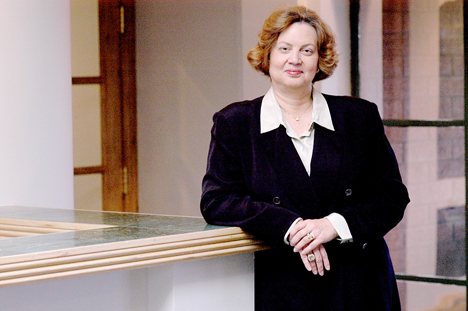 Susan Bitter Smith, is the Executive Director of the Arizona – New Mexico Cable Communications Association. Susan is currently serving her second term as an elected member of the Central Arizona Water Conservation District Board of Directors. She was elected President last year – the first woman to serve as President of the CAWCD Board. As a member of the CAWCD Board, Susan was instrumental in working with Arizona’s Congressional Delegation in the settlement of the CAWCD Repayment Settlement dispute with the United States Department of the Interior and the federal finalization of the Gila Indian Water Rights dispute. She is a former Vice-Mayor and City Council member in the City of Scottsdale, Arizona, and was active as a Councilman in the areas of economic development, planning and zoning reform, water delivery issues, and budgetary reform. She is a Past Chairman of the Walter Cronkite Foundation, a Past President of the ASU Alumni Association, and the Honorary Chairman of the ASU MBA Alumni Council. She is a Past Chairman of the American Society of Association Executives, is the Past President of the Arizona Society of Association Executives, and received ASAE’s highest award, the Key Award for Lifetime Achievement in 2001. Susan chaired the Arizonans for Bush campaign in 1988 and 1992 and was Chairman of the Steve Forbes for President campaign in Arizona in 1996. Susan is the co-host of the “Arizona Almanac” radio show, and was a Republican candidate for Congress in Arizona’s First District in 2000. Susan and her husband Paul have two children. The exploritory web site can be found here. The luncheon costs $25 per person. Reservation checks made payable to Maricopa County Republican Committee can be mailed to MCRC Sun City Office, 10050 W. Bell Road, Suite 49, Sun City, AZ 85351-1291. For further information call the MCRC office at 623-977-4532. Is There An Eligibility Issue? The Conservative Movement lost a Founding Father today. 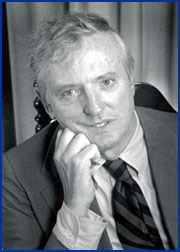 William F. Buckley Jr. passed away at his home in Stamford, Connecticut at the age of 82. Buckley was best known as the founder and editor of the conservative journal, The National Review but he was also multi-talented as a pro-lific author, novelist, editor, columnist, debater, talk-show host, concert-level harpsichordist and trans-oceanic sailor. William F. Buckley, Jr. can also be credited for influencing and inspiring such conservative leaders as President Ronald Reagan and radio-talk show giant, Rush Limbaugh. Conservatives mourn the passing of Mr. Buckley and join together in prayer for his family.